It was in 1961 that the announcement was made that a new parish was being created in the Magdalene/Bingham areas. This was greeted with delight and much enthusiasm. 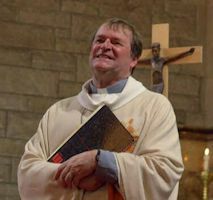 The energy and vision of the priest, Father Lawrence Glancey, together with the co=operatiion and effort of his parishioners resulted in forming a welcoming and spiritual community. Obviously there followed years of hard work with some disappointments and frustration. This was especially felt when the opening of the church itself was delayed for almost two years because of building problems. Just as it wa sthought to be ready foer occupnacy water was discovered under the church and athe delay followed. However, now, in 1886 all of that is behind us and we are free to celebrate 25 years of happy parish life. The occasion was marked with a lovely concelebrated Mass followed in true St. Mary Magdalene tradition with refreshments in the parish hall and porch. It was decided tio commission the creation of a stained glass window between the main chapel and the day chapel. AS with all the furnishings of the church much thought and care went into this window and the result is splendid.. 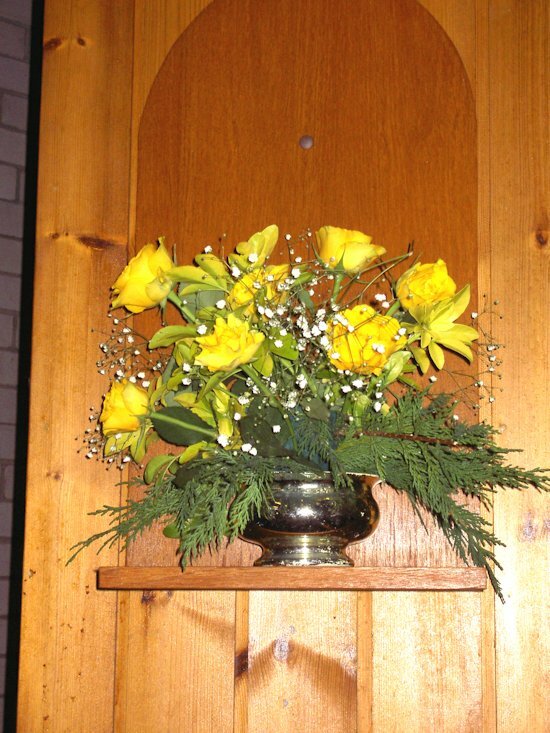 It will be a constant reminder to parishioners in the futuer of the love and dedication of the parishioners in 1986. We hoope the traditions of our parish will contine over the years. Ufortuenately the picture below does not do justice to the beauty of the window qwith its vibrant colours. Once agais the parishioners decided to celebrate the anniversary of the parish rather than the anniversary of the opening of the present church. The Parish of St. Mary Magdalene had existed since 1961 but without the benefit of a church building. The absence of such a basic requirement did not hinder the formation of one of the happiest and friendliest parishes in the diocese. 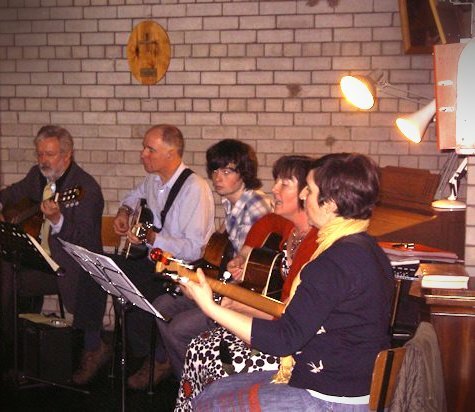 The parishioners had to improvise and co-operate not only with each other but with their neighbours and friends in the area. The Miners' Institute Hall became their venue for Sunday Masses as well as Holy Day Masses. The largest room in the Parish House was the oratory where weekday masses were offered. The Parish Houes garage was the committee room and the venue for the meeting place of various organisations. Rooms in some parishioners houses were also made available for parish use. The building delays , though frustrating did not affect the parish too much though the eventual availablilitty of the church was avery welcome asset. As with the celebrations for the 25th Anniversary the paris celebrated with a beautiful concelebrated Mass followed by refreshments in the porch and hall. We were happy to mark another landmark in the journry of the Parish. 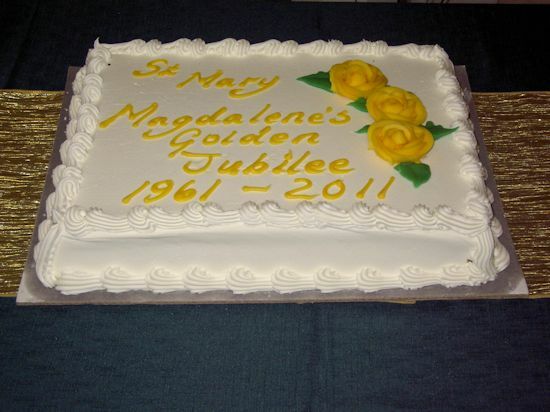 On Friday 8th May 2009 Father Hennessy celebrated his Golden Jubilee with members of his family, his fellow priests, his friends and his parishioners. As Father Hennessy does not enjoy being in the limelight and wanted a simple celebration we respected his wishes. Neverthelesss the evening although simple was a happy one. The evening started with Mass at which the other priests concelebrated Mass with Father Hennessy. Father Henesy, from St. Patrick´s parish gave the homily. Laura Tweedie, on behalf of the Parish, presented Father with a cheque for the sum of £1080. Father Hennessy, after 21 years as Parish Priest of St. Mary Magdalene´s, will retire officially on Wednesday the 31st of this month. However it will not be complete retirement as, on the 1st of September, he will become the resident Chaplain for St. Joseph´s Home run by the Little Sister of the Poor in Gilmore Place, Edinburgh. While we are very sorry to see him go we are also aware that, for him, this is in his best interests. He will be released from the responsibilities of running a parish yet will still have an important Ministry. Also since he has had some health problems lately, in St. Joseph´s, he will have people to look after him. We wish him well. Today Sunday 28th August was therefore the last Sunday that Father Hennesy would celebrate Mass as our Parish Priest. Father Hennessy does not like a fuss and does not enjoy the limelight so it took some gentle persuasion on the part of the Parish Council to get him to agree to a very low-key send -off in the Hall after Mass. 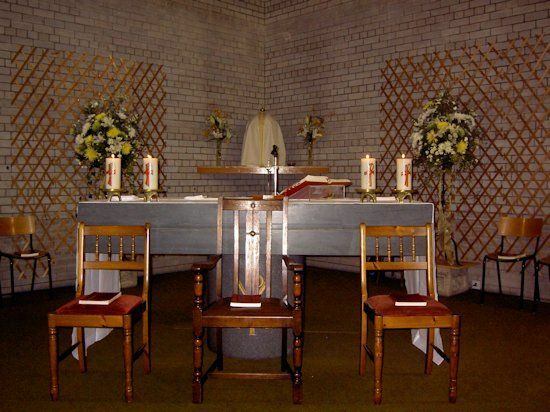 Father Hennessy´s has given 21 years of dedicated and loyal service,in St Mary Magdalene´s Parish For all of Father Hennessy´s 52 years of service in this Diocese of St Andrew´s and Edinburgh he showed the same dedication annd care for his parishioners. Father Hennessy´s years of service greatly exceeded what wuld be expected in any other profession and with that in mind we are delighted that now he can take things more easily. We wish him many years of happy retirement. After Mass a presentation was made, presented by the children of the parish on behalf of the parishioners and the children and staff of the local primary school St. John´s of which Father Hennessy has been the chaplain for all these 21 years. The Head and Deputy Hean and two members of staff of St. John´s school attended this Mass with us. The Chair of the Parish Council Mrs Una Gallagher thanked Father Hennessy on behalf of all of us and expressed our regret that he had to go and she assured him that he would not be forgotten. We then all retired to the Hall for the final celebration. Now as the farewells have been said and Father Hennessy leaves with some regrets but also with feelings of excitement annd hopes for the next stage of his life, we, his Parishioners must do likewise and look forward to the arrival of our new Parish Priest, Father Tabone. you are very welcome Father! We are delighted to welcome our New Parish Priest - Father Tabone arrived on September 2nd 2011. Father Tabone took up residence in the Parish House and offered Sunday Mass for the first time as our new Parish Priest on Sunday 4th September so we were never without a priest. As a Parish we have been truly blessed and now look forward to working under the guidance of Father Tabone. We can scarcely believe our good fortune and we hope that Father Tabone will be happy here with us. The celebration was a great success. Many of the priests from surrounding parishes as well as former Parish Priests of St Mary Magdalene´s were present. It was abeautiful, concelebrated Mass. Over 200 parishioners and friends attended Mass and joined in the celebratiion in the Hall and Porch later. This was a particularly happy day for us as parishioers since the future of our parish had been in doubt following the announcement that Father Hennessy was to retire in the summer. There may not have been a parish now for us to rejoice in. We are indeed very blessed to have Father Tabone as our new Parish Priest. We pray now that St Mary Magdalene's Parish may continue to flourish for many years to come. 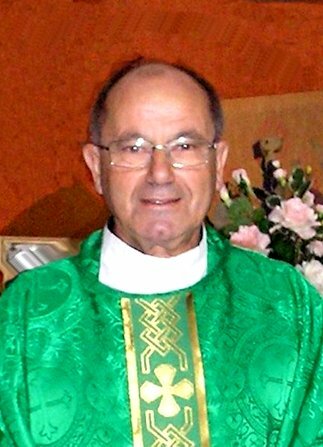 On Sunday 24th November2013, Father Tabone´s last Sunday in Scotland, a farewell Mass of Thanksgiving, was offered in St. Mary Magdalene´s Parish. Father Tabone concelebrated Mass with our new Archbishop Leo Cushley and his fellow priests in the diocese. Former parishioners from his other charges flocked to take part with special buses bringing well-wishers from Stirling and Broxburn. Visitors came from the surrounding parishes. It goes without saying that his present parishioners turned out en masse and the church struggled to accommodate us all. Everyone was sorry that Father Tabone is going but happy, for him, that he is going home and will have a more leisurely life there - he certainly did not get much leisure time in Scotland. After a beautiful and cheerful Mass tribute was paid to Father Tabone by Mrs Una Gallacher, Chair of our Parish Pastoral Council. Her speech is printed below. Your Grace, Reverend Fathers, Ladies and Gentlemen. For those of you who don"t know me, my name is Una Gallagher, and I am the chair of St Mary Magdalene"s Parish Pastoral Council. I"ve been asked to say a few words. I think what I have to say could be condensed into 2 words. Some of you may think those words should be "Don"t go" but they are in fact "Thank you". We have called this a Mass of Thanksgiving, not because we were thankful you are going, Father Tabone, but because we wanted to say thank you, to you and to God, for all you"ve done in your Ministry in Scotland these last 37 years. You began your priestly ministry as a missionary in Africa then came, some might say as a missionary, to Scotland. We are very grateful that you did so. Africa"s loss has been Scotland"s gain I think it"s a testament to your many gifts, in particular to your ability to reach out to people and to engender and inspire loyalty and love, that today we welcome so many from all your former parishes: from St Columba"s in Edinburgh, from St John Cantius, Broxburn, from Sacred Heart, Cowie, St Mary"s Stirling, and St David"s, Dalkeith. We also welcome people from our local churches and schools, from St John"s, where you are currently the administrator, and from our other sister parishes. As well as your parish work, you have worked as a hospital and university chaplain and chaplain to HCPT. You have even spent time in prison in Scotland. I have to emphasise that this was as chaplain - to Cornton Vale Women"s Prison- not as an inmate! In all of these places you have made a lasting impact on the lives of the people you met. One of the things which struck me when you came here, Father Tabone, was the number of people from your previous parishes who came here to visit you,and who still come. I"m willing to bet that that will continue when you return to Gozo. I am quite sure air traffic to Malta will be on the increase, so I was thinking this might be a good time for us all to take shares in Ryanair. Here in St Mary Magdalene"s I think it is no exaggeration to say that you have given new life to this parish. You have regenerated the parish in the two years that you have been here. You have brought in more people, in particular families with children; we now have many more children for our children"s liturgy, and more people involved in the Parish Council, and in other activities in the parish. We have also had the great pleasure of your sermons to the children at our children"s masses. You have a wonderful ability to engage with the children; you are very inventive in the use of props, (I think of the bicycle wheel which we found behind the altar the other day), and you are never fazed by the children"s answers to your questions, no matter how off the wall they are! You have changed the atmosphere here in St Mary Magdalene"s; people now say " there is a buzz about the place" and a renewed sense of purpose. you are "such a good man"; you are "such a good priest"; you "live very simply"; you "practice what you preach" you "lead by example". And most importantly "you reach out to people, especially the poor and the sick." And of course everyone I spoke to mentioned your sense of humour, (which has been evident today), and which is a gift that fosters a real sense of community. People always leave this church, and I"m sure all your previous churches, with a smile on their faces	I think there will be fewer smiles today. We are very sad to lose you, but we are very pleased for you. We are pleased that you are now going home to your own family,and to your own people. Father Tabone, we have loved having you here. We thank you for your faith and for the love you have shown us. We thank you for all that you have done as a priest here in Scotland. We wish you well and we hope you will come back to see us. I will end as I started, with those two words. Father Tabone, Thank you. As a mark of our appreciation we have a few gifts, which some of our children will now bring up. When it was annnnounced that Monsignor Rae, from St John the Evangelist Parish in Portobello, was to retire this year the future of St. Mary Magdalene´s seemed uncertain again. With the retiral of the priests from two parishes situated only 1.5 mile apart and with a shortage of priests we were afraid. that as the smaller of the two parishes we may not be viable. It was with relief that we were informed that one priest would serve both parishes. St Mary Magdalene´s would still remain a parish. Obviously with one priest looking after two parishes there would be changes. We could not expect daily mass for one thing and of course there would be other cahnges too. This we willingly accepted and looked forward to the arrival of FATHER JOCK DALRYMPLE as our new Parish Priest. Sadly Father Tom Hennnessy died on Friday 24th April 2015 and was buried from St. Mary Magdalenes´s Church on Friday 1st May. Requiem Mass was celebrated by Archbishop Cushley and concelebrated by many priests from the Diocese. 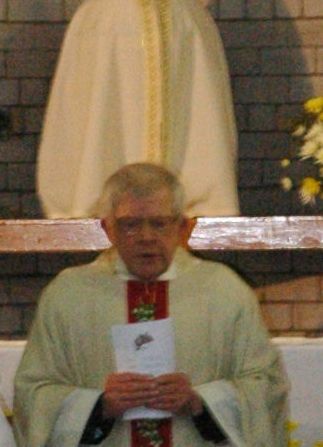 Father Tom Hennessy was our Parish Priest for almost 21 years before his retirement three years ago. We, the parishioners, feel honoured at being able to say good-bye to our much loved and respected Father Tom by hosting his Requiem Mass and by offering hospitality to the many mourners who came to pay their respects. We are grateful to our current Pariah Priest, Father Jock Dalrymple for all his work in leading us in this service and for his support. "I have been asked to say a few words about Fr Tom Hennessy, especially about his time as parish priest here. Fr Tom was parish priest in St Mary Magdalene´s for over 20 years, more than 2 decades. That´s a big part of the history of this little parish, and it was a big part of Fr Hennessy's priestly ministry. So it's absolutely appropriate that he should be buried from here, as he asked to be." I don´t know if virtues go in and out of fashion, but we hear rather less of humility nowadays. But Tom Hennessy was a genuinely humble man, "meek and humble of heart". He was the least ostentatious of men. Anything but self important. Small in size, tentative even timid in his manner, he was about as unassertive as you can get. But there was core to him. A core of determination, even stubbornness; a dogged commitment to his duties and responsibilities; and a dedication that was a particular kind of courage. Here was a man who shunned public attention, was happiest when quietly reading, yet who steeled himself to stand here every Sunday in front of you all to preach and to say Mass. Here was a man who was naturally shy, nervous about talking to people, but took his duties of pastoral care very seriously. Many people will tell you stories of Father Tom coming simply to be with a person who was ill, and housebound. Visiting the parishioner not seen at church for a while, the person he was worried about, or wanted to show that he cared about what was going on in their lives" example visiting the Iraqi husband of a parishioner at the time of the Iraqi war. Above all he was a priest. We can say rather glibly that priesthood is a vocation, not a job, but for Tom Hennessy it was the bedrock of his identity, what he was through and through. When as a young man he was really rather badly injured in a motorcycle accident,and I know many of you will struggle to imagine him as a leather clad motorcyclist, his only real concern was whether this would affect his capacity to act as a priest. He was a bit like a stick of rock. It didn't just say priest on the outside, but all the way through. If you had broken him in half that's what the letters in the middle of him would have read. Of course this in its turn was based on a deep personal piety, but also perhaps not known to many people, really quite a substantial degree of scholarship. He was well read and very thoughtful on matters theological. You could tell that in his sermons. Over the decades, I guess I must have heard nearly 1000 of them. They were always carefully thought through, well structured and always had some substance, sometimes maybe a wee bit over the heads of the congregation, but never superficial. Indeed, though he was a very dutiful servant of the church, he had his own quiet but firm opinions: there was a little bit of the revolutionary in him. He was probably most frugal man I ever met. He didn't spend money on clothes, cars or even food. Just as well, as he was completely hopeless with money. Tom didn't enjoy good health. Apart from his accident, he suffered from diabetes. People were sometimes bemused to find that during a parish meeting he had nipped off for a cup of tea and a bit of toast. And latterly, he worked on when a less determined man would have retired, and in the end gave rather more than his health and strength allowed. We'll all have our particular memories of Father Hennessy. It might be the man who polished the chalice so long and vigorously after communion that it"s a wonder we"ve still got one. Or it might be the man who came to sit quietly with the housebound parishioner. Well he is walking up a different hill now, to a different home. And the door will open for him there as well.